Being a twin, I have found twins are so fascinating. Thus, started the journey to find interesting facts! Taller Twins are more likely to have twins: Taller women have much more insulin growth factor, which increases ovary sensitivity and chance of ovulating, which in turn can lead to double egg releases and fraternal twins. Yogurt and Milk can make you have twins: Women who consume dairy are five times more likely to have twins. Female cows produce insulin growth factor, which finds its way into their milk, which gets into our bodies when we drink it and increases our levels of IGF. Because of this, people who have a vegan diet are five times less likely to have twins. 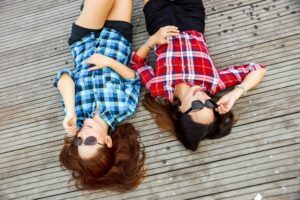 Some twosomes speak “Twin Talk”: According to research published in the journal Institute of General Linguistics, about 40 per cent of twins invent their own languages. The researchers believe that super-close siblings (they don’t actually have to be twins, but usually are) sometimes use each other as models for learning vocabulary, applying meaning to sounds — even if those sounds are complete nonsense. Usually their special lingo disappears as their vocabulary expands and by the time they start school, but not always. My mom always said we had our own language and we definitely have eye language! 22% percent of twins are left handed, compared to 10% in singletons; I have met a lot of twins that are, we are as well. However, I find that we are both very right and left handed. A study shows vegans are five times less likely to have twins than women who consume diary. Hence the fact above! Massachusetts has the highest rate of twins than any other state! At nearly 4.5 for every 100 live births, Massachusetts has the highest rate of twin births. Connecticut and New Jersey follow with 4.2 twins per every 100 births.